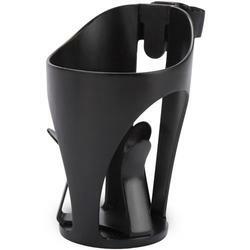 Diono Stroller Cup HolderThe Diono Stroller Cup Holder easily attaches to your stroller for drinks on the go! The self-adjusting cup holder swings freely with gravity to keep drinks upright. The universal clamp works with most strollers, and may remain attached when stroller is folded. Accommodates cans, bottles and cups. The three-prong grip holds drinks securely and the beveled top allows easy drink removal.